Third, sanctions have sown economic havoc in Venezuela. They’re spoken of in such calm tones that an already innocuous word loses even what little force it might have had. But sanctions kill. As do deprivations arising from US-Saudi manipulation of world oil prices with the precise aim of weakening rival powers and punishing disobedient vassal states. Specifically, what is sold to us – by manifestly interested parties including market driven media – as product of “socialist incompetence” in Venezuela is in fact the fruit of a criminal empire determined, as all empires are, to maintain its supremacy by all means and at all and any cost. I’m crying for you, Venezuela. Already posted Steven Gowan’s piece but there’s no harm in doing the same with your article and with Ben Norton’s as well, for good measure. I do hope the presence of Russia and it’s strategic bombers will dissuade the imperialist cabal from further NGO supported right wing violence, but they’re in it for the long haul, too much is at stake so the CIA will keep pumping money into the NGO’s who in turn will continue to bankroll the co-opted extremists. Guaido would sell his granny to get his sticky mitts on the oil and gold rather than share it with the people, I don’t hold out much hope. The US illegal economic sanctions have been like a hammer blow to an already struggling economy – as was intended – I wish it were otherwise. China likewise could bail the country out, knowing they will end up owning what was loaned for, but at least in Africa, they have kept jobs in place on the same wages, something the US cabal have nnever done. Especially dispiriting is the way large swathes of the liberal intelligentsia are taken in every time – “yes, Chile was terrible but this is different”. No fool like an educated fool! What can we do? Bear witness. Ziad Fadel of Syrian Perspective has also done his own take on the US aggression against Maduro. Ziad’s article(granted he is very pro Assad, but thens o apparently are 72% of the nation’s people. I’m (cautiously) pro Assad myself, Susan. Some tidbits I picked up from OffG and MoA comments sections. 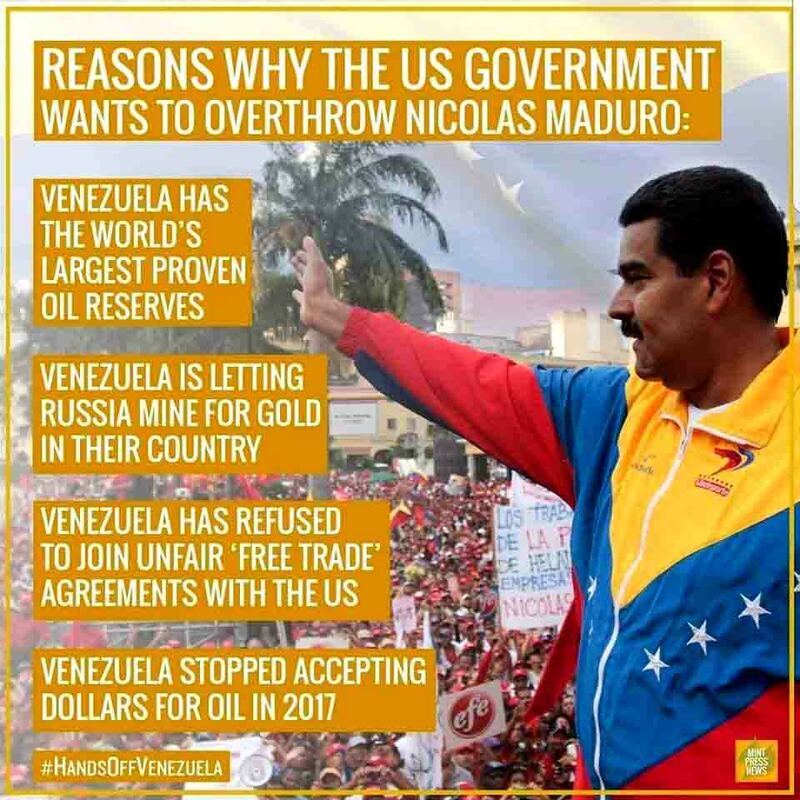 Venezuela: Socialist, large oil and gold reserves, began selling oil for gold and/or Euros, gold reserves held in English banks and England refuses to return them. “I don’t have much time, but I wanted to make a quick point: Venezuela doesn’t have any, and it is not sitting on oceans of, oil. Not in the way people may imagine. What Venezuela does have in abundance in the Orinoco Belt is sulphurous tar that is costly to extract. It also needs diluting, which is why Venezuelas imports of lighter grades of oil and diluents like naptha are up, and exports down. Someone mentioned the sell cheap (at or below the cost of production), buy back expensive scenario. Vexarb mentioned the need for a Pacific coast refinery, to avoid having to sell to the US Gulf Coast refiners (who can control the price on quality issues). Needless to say he got an up vote from me. Astute comments but I don’t see a way to help. Bad feeling of helplessness. Great quote from Smedley Butler…is it from a book or from an interview? I also agree that no strategic reason is needed for US intervention (see pitiful Haiti), since no single example of self determination can be allowed, oil or no oil. Good letter, Steel City Scribe! So many citizens seem to debate invasions or coups down south like gamers at their xbox , choosing invasion, evaluating the legitimacy of the Maduro govt as if that were their competence or prerogative, as if being plugged into the console of american propaganda gave them the right to “play”. 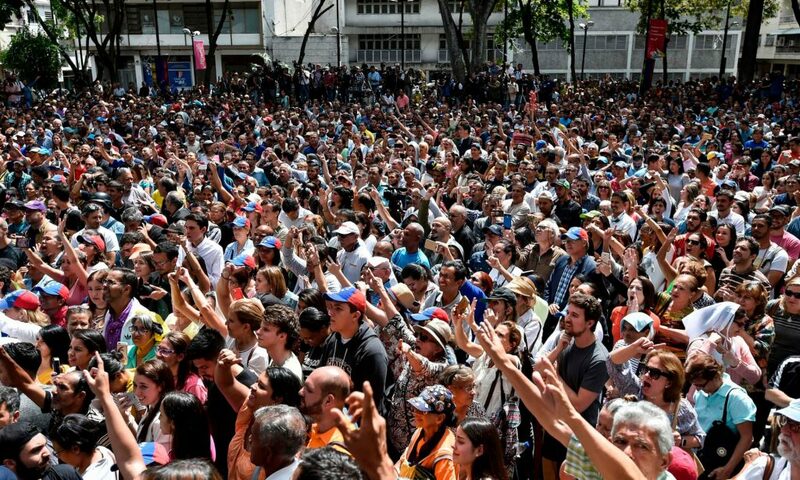 We have yet to field a social democracy movement like the ones in Bolivia and Venezuela. As regards to democracy, we come to them as pupils, as serfs. I have heard a lot in us press about Maduro graft, kleptocracy, Chavez’ daughter hiding four B in Andorra, etc. No doubt there was some thievery (the chavistas were not uppermost in the Maduro coalition I thinkk?) Probably like the Greeks they should better not have honored their debts….look where compliance has gotten them. It could also be, as was the case(much smaller numbers) in Aristide’s Haiti when I was there, that Chavez’ daughter has salted away an economic war chest of four billion for the revolution where it cannot be devalued, since they have faced the manipulation of oil prices, the freezing of gold assets and so on. Thanks for your sheet. Thanks Gabriel. I like your xbox analogy. I do see a huge part of the problem as that otherwise sophisticated reasoners look at the latest “enemy of peace/democracy/human rights” as if at something new. That, and a failure to ask the cui bono question. The Smedley Butler quote is well known, though not as well known as it deserves. Google his name and you’ll find it. Or follow the link I put in. Good listen Susan, thanks. I’ll make it steel city scribblings’ next tune of the day! We know that the sub primes like Shale have become a liability even though they, like the gold sands are heavily subsidised, so is there a trick that is being missed or am I grabbing at straws and sounding like a conspiracy theory nut?Just thought I’d throw my musings into the mix. I agree Susan. I see various specific factors – gold, dollar hegemony and oil – in play but also an overarching imperative for the USA to crush any and all attempts to assert a modicum of independence in Latin America. Witness, most recently, the fate of Lula in Brazil and Zelaya in Honduras. The fate of Lula and Zelaya was a disgrace but shows the level of US foreign hypocrisy and overt intervention in other countries. How obscene then, they should use supposed Russian intervention in their so-called democracy. One good thing to come out of Russia’s aid to Maduro is the $5 billion for gold mining. The US cannot touch it because it is to facilitate part payment of the debt Venezuela cannot pay to Russia. Who knows, maybe there will be enough gold mined that a surplus would ease the murderous sanction situation that Washington has imposed. From what I have observed, Russia and China, even when they are in competition with each other, seem to have a gentlemen’s agreement on how to work alongside each other, for the common good. Would that the western Imperialist adopt such an honest business strategy. US aggression which equates to terrorism by any other name, is so glaringly obvious, still seems to be backed by those other aggressors – EU and fascist regimes in S. America. I only hope Maduro hasn’t made a tactical error in transferring his oil refining to Turkey, Recep does not have the finest reputation for his honesty, but in fairness to him, he has backed Venezuela against the US and seems to be building bridges he previously burned down. Fingers crossed though, there are so many facets to this situation, which makes it hard to keep track of all the blind alleys and red herrings. I do like what Chris Williams had to say on Venezuela in parliament – that has to count for something, doesn’t it?